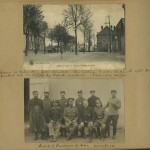 These album pages were compiled by Captain Jack Archer (1871-1954), a rifleman who was taken prisoner after being wounded during the German capture of Cambrai in August 1914. 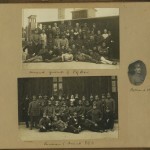 He served out the duration of the war in the German Prisoner of War Camp at Merseburg near Leipzig , before being transferred to Scheveningen in neutral Holland. The photographs are interesting in that they show the variety of prisoners of different nationalities. How many of these friendships endured after conflict had ended, I wonder? 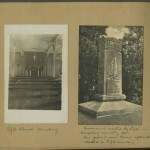 The memorials to the dead with which we are familiar usually post date the war but this album provides an interesting exception – a memorial erected by POWs themselves in Merseburg in 1915. I was speculating that if Britain and her allies had been triumphant in 1915, its bold lettering, ‘1914-1915’ might today be replicated across the world. For how long did the prisoners present at its unveiling believe they would remain captive and estranged from their families and comrades? Would the war ever have an end? 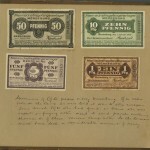 The examples of paper ‘money’ are fascinating – Archer tells us the notes were only current in Merseburg but that French forgers would send parcels containing thousands of bogus notes to prisoners in the camp. Consequently, the Germans, he observes, ‘must have lost a considerable amount of money’. This entry was posted in Liddell Hart Centre for Military Archives, Military history and tagged cambrai, merseburg, Prisoner of war, World War One by Lianne Smith. Bookmark the permalink.